Spectrum Surgical is an industry leader in providing hospital and veterinary surgical instruments. 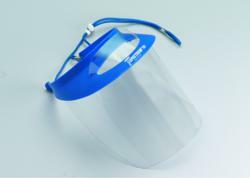 We are pleased to also extend our product line to a face shield visor during decontamination process. Spectrum Surgical Instruments Corp. is pleased to provide a protective face shield and visor. This visor/shield has been designed to provide protection, comfort, and safety during the surgical instrument decontamination process. The distortion-free, optical-grade shield is non-fogging and easily fits over masks, goggles, and glasses. The design allows for optimal air circulation. Spectrum’s visor is available in blue, white, neon-yellow, neon-magenta, and teal, for easy identification.